First, let’s listen more closely to a feisty little bird whose song I describe as a “sonic explosion” – the House Wren. He’s the one in the picture at the beginning of this post – a small, brown bird with a big attitude. His song is an emphatic jumble of notes too rapid and complex for mere humans to fully comprehend, and impossible for us to imitate. And how can something so small be so loud? I once sang with a choral ensemble at a garden party on someone’s private property. 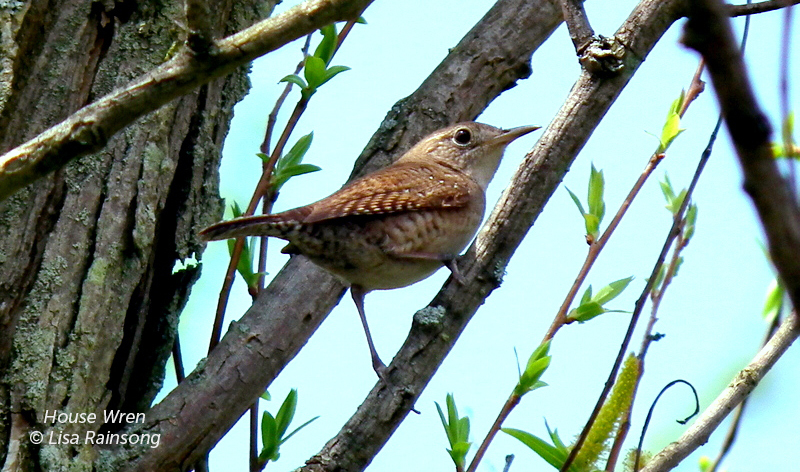 A single singing House Wren in the garden overpowered the entire human chorus! House Wrens are cavity nesters that will happily take over one of the Bluebird or Tree Swallow houses near the pond, but this little guy seemed to be going in and out of a hole in a tree. It looked like this might have been a woodpecker nest cavity at one time, but he was loudly claiming it for himself and his potential offspring. Male House Wrens will stake out more than one possible nesting location and fill each with twigs. The female makes the final choice, though, and I don’t think she found the tree cavity to be acceptable. 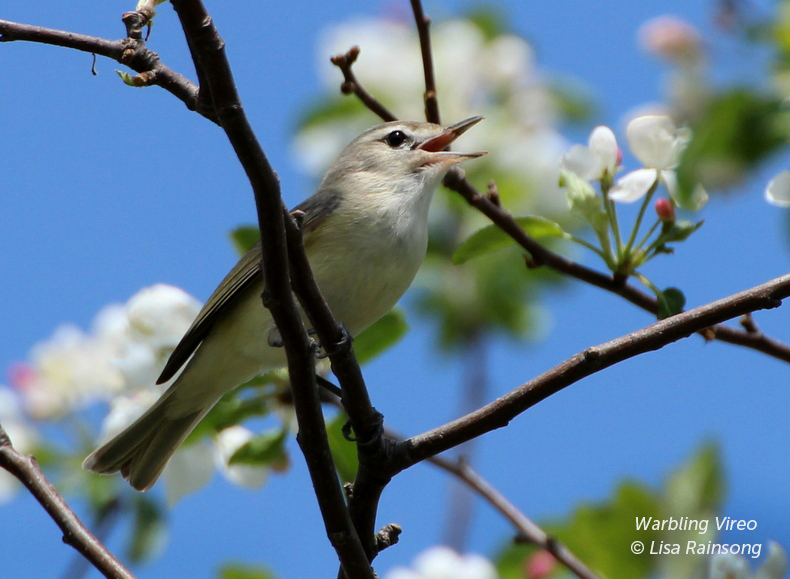 Now let’s turn our attention to the other species whose song is obvious in the recording – the Warbling Vireo – whose excited, speedy song usually ends with an emphatic upturn. This rather small small songbird is typically found up in the trees along rivers, lakes, and ponds. “Found” may not be the most accurate term, though, as it implies that you’re actually going to see these birds. Like the House Wrens, they’re much easier to hear than to see. Warbling Vireos do indeed seem to “warble,” and their songs are very different from the Red-eyed Vireos I hear all day long in the summer woods. I love the upturn that often occurs at the end of the song – it sounds like a question has just been posed. I didn’t realize until I looked closely at the sonogram for this recording that each statement of the song is a little different. It’s difficult to discern because the song is quite rapid, but here’s what it looks like if I take out the other birds and the pauses between the songs. Now if only I could hear fast enough to catch every bit of the detail! I’ve never heard so much Warbling Vireo song around the pond before! Eventually, though, this dynamic little soloist decided to move across the meadow to one of the university’s research ponds up the hill. I can only hear him in the distance now, but I’m glad I had the opportunity to observe him up close. And that brings us to a third species heard in the recording – the Eastern Meadowlark – a species you might not associate with a pond. They’re here because of the large meadow areas that adjoin this pond. Meadowlarks are fairly large and quite striking, but it’s amazing how well they disappear into the color and texture of the meadow. Like many other species, they are often easier to hear than to see. This next recording is one of the two Meadowlarks that were close to the pond, and we’ll hear the other Meadowlark momentarily. There was second Meadowlark a little distance away from the far end of the pond, and he was singing a somewhat different song. My last recording for today is that Meadowlark surrounded by some of the other bird songs we’ve enjoyed by the pond. The birds have established their territories and most are feeding nestlings. Some already have noisy, begging fledglings and some species will nest again and raise a second brood. On our next walk, let’s listen to how birds like the Song Sparrows define and defend their territories through song. Perhaps we’ll be able to listen to some of the begging babies as well. In the meantime, listen to the birds in your favorite spot to see and hear – what you can notice about how they are using song to define their territories. Let’s check back with each other soon! Your first Eastern Meadowlark differs a bit from what I hear in my part of the world (Southern Ontario). Dialects I suppose. The Warbling Vireo is a favorite of mine and a couple of years ago an older birder described its song to me as saying “If I sees ya I will squeeze ya and I’ll squeeze ya ’til it hurts”. I often use this mnemonic when sharing the bird song with others; if you try to fit those words to the song it doesn’t work at all, but the cadence is right. The first Meadowlark was a little different from what I typically hear, too, Peter. I was surprised by how forceful he sounded as well! Superb Job of recording. I have loved the Meadowlarks ever since looking one up and Identifying It with my Dog eared Field guide to the Birds. I was around 10 years old at the time. Hearing your recording brought back Boyhood memories of the joy and Awe That Birds can bring, if we only slow down and enjoy them. Im 57 now, and still am amazed at these little Creatures of God. What Kind of Equipment did you use? Steven, I have a Marantz PMD 620 recorder and a Sennheiser shotgun microphone. They’ve been impressively durable and manageable in marshes, meadows, swamps, ravines, and anywhere else I need to go. Hi Lisa, Thanks for the great post! I never realized that rattling call was an eastern meadowlark either, until you just taught me something new about the birds in my area! I hear several birds making that sound very frequently, but never associated it with a meadowlark. I love checking the bird song mysteries off of my list when I get a chance! Thanks again, keep the great stuff coming! Nick, I was surprised when I first figured out that Eastern Meadowlarks make this rattle call and other harsh, dissonant sounds (dissonant to our ears, anyway). These sounds couldn’t be more different from their lovely songs. I absolutely share your delight in learning those bird song mysteries. Enjoyed the photos, and listening to the accompanying recordings. 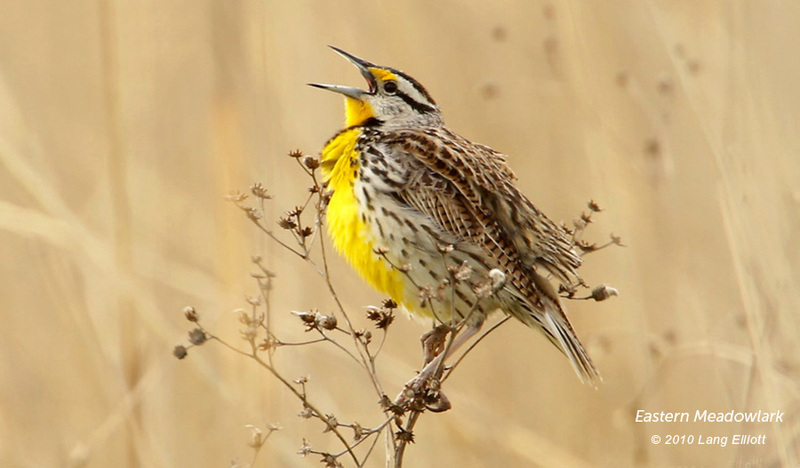 Meadowlarks sure have an interesting repertoire. great sound captures, and wonderful pictures. troglodytes aedon … sung by Fred Rogers. my favorite bird song. lovely to have your newsletters/blog posts. Another great presentation! What a pleasure it is enjoy these gifts of nature.